Gillet, D. J.; Parks, A. N.; Bay, S. M. 2019. Calibration of the Multivariate AZTI Marine Biotic Index (M-AMBI) for Potential Inclusion into California Sediment Quality Objective Assessments in San Francisco Bay. SFEI Contribution No. 939. San Francisco Estuary Institute: Richmond, CA. Sutton, R.; Chen, D.; Sun, J.; Greig, D. J.; Wu, Y. 2019. Characterization of brominated, chlorinated, and phosphate flame retardants in San Francisco Bay, an urban estuary. Science of the Total Environment 652, 212-223 . SFEI Contribution No. 859. Flame retardant chemical additives are incorporated into consumer goods to meet flammability standards, and many have been detected in environmental matrices. A uniquely wide-ranging characterization of flame retardants was conducted, including polybrominated diphenyl ethers (PBDEs) and 52 additional brominated, chlorinated, or phosphate analytes, in water, sediment, bivalves, and harbor seal blubber of San Francisco Bay, a highly urbanized estuary once considered a hot spot for PBDE contamination. Among brominated flame retardants, PBDEs remained the dominant contaminants in all matrices, though declines have been observed over the last decade following their phase-out. Hexabromocyclododecane (HBCD) and other hydrophobic, brominated flame retardants were commonly detected at lower levels than PBDEs in sediment and tissue matrices. Dechlorane Plus (DP) and related chlorinated compounds were also detected at lower levels or not at all across all matrices. In contrast, phosphate flame retardants were widely detected in Bay water samples, with highest median concentrations in the order TCPP > TPhP > TBEP > TDCPP > TCEP. 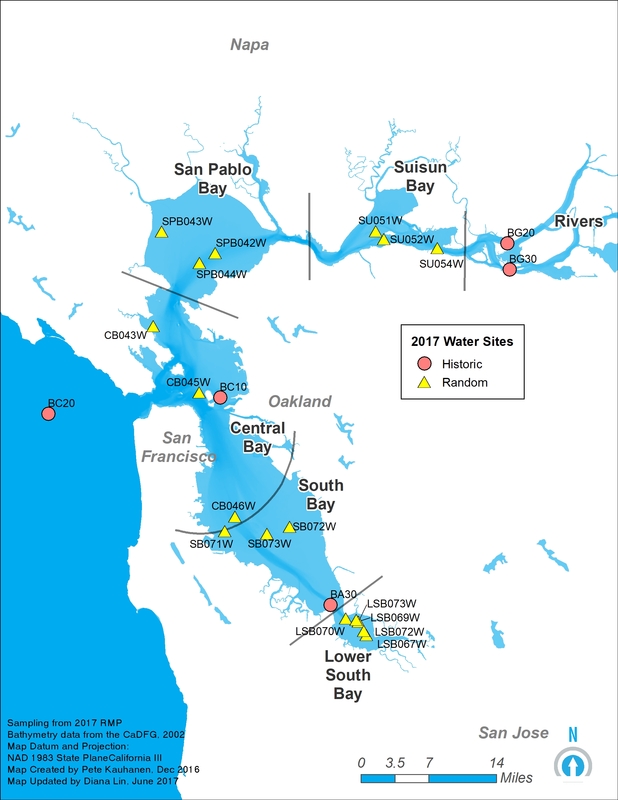 Concentrations in Bay water were often higher than in other estuarine and marine environments. Phosphate flame retardants were also widely detected in sediment, in the order TEHP > TCrP > TPhP > TDCPP > TBEP. Several were present in bivalves, with levels of TDCPP comparable to PBDEs. Only four phosphate flame retardants were detected in harbor seal blubber: TCPP, TDCPP, TCEP, and TPhP. Periodic, multi-matrix screening is recommended to track contaminant trends impacted by changes to flammability standards and manufacturing practices, with a particular focus on contaminants like TDCPP and TPhP that were found at levels comparable to thresholds for aquatic toxicity. Shimabuku, I. 2018. 2017 Update to Cyanide Rolling Average. 2018. 2017 Water Cruise - Copper and Cyanide Sampling Map. Trowbridge, P. 2018. 2018 Bay RMP Multi-Year Plan. SFEI Contribution No. 860. San Francisco Estuary Institute : Richmond, CA. Davis, J. 2018. 2018 Regional Monitoring Program Update. SFEI Contribution No. 906. San Francisco Estuary Institute : Richmond, CA. Trowbridge, P.; Wong, A.; Davis, J.; Ackerman, J. 2018. 2018 RMP Bird Egg Monitoring Sampling and Analysis Plan. SFEI Contribution No. 891. San Francisco Estuary Institute: Richmond, CA. Shimabuku, I.; Trowbridge, P.; Salop, P. 2018. 2018 RMP Bivalve Deployment Cruise Plan. SFEI Contribution No. 892. San Francisco Estuary Institute: Richmond, CA. Salop, P. 2018. 2018 RMP Bivalve Deployment Cruise Report. SFEI Contribution No. 903. San Francisco Estuary Institute : Richmond, CA. Shimabuku, I.; Trowbridge, P.; Salop, P. 2018. 2018 RMP Bivalve Retrieval Cruise Plan. SFEI Contribution No. 893. San Francisco Estuary Institute: Richmond, CA. Shimabuku, I.; Trowbridge, P.; Sun, J. 2018. Bay 2017 Bay RMP Field Sampling Report. SFEI Contribution No. 849. San Francisco Estuary Institute : Richmond, CA. Gilbreath, A.; Pearce, S.; Shimabuku, I.; McKee, L. 2018. Bay Area Green Infrastructure Water Quality Synthesis. SFEI Contribution No. 922. San Francisco Estuary Institute : Richmond, CA. Peacock, M. B.; Gibble, C. M.; Senn, D. B.; Cloern, J. E.; Kudela, R. M. 2018. Blurred lines: Multiple freshwater and marine algal toxins at the land-sea interface of San Francisco Bay, California. Harmful Algae 73, 138-147 . SFEI Contribution No. 875. MacVean, L.; Trowbridge, P.; Lewis, L.; Hobbs, J.; Sylvester, Z.; Winchell, T.; Senn, D. 2018. Dissolved Oxygen in South San Francisco Bay: Variability, Important Processes, and Implications for Understanding Fish Habitat. SFEI Contribution No. 911. San Francisco Estuary Institute : Richmond, CA. Denslow, N.; Kroll, K.; Mehinto, A.; Maruya, K. 2018. Estrogen Receptor In Vitro Assay Linkage Studies. SFEI Contribution No. 888. San Francisco Estuary Institute : Richmond, CA. McKee, L.; Gilbreath, A.; Pearce, S.; Shimabuku, I. 2018. Guadalupe River Mercury Concentrations and Loads During the Large Rare January 2017 Storm. SFEI Contribution No. 837. San Francisco Estuary Institute : Richmond, CA. Jahn, A. 2018. Gut Contents Analysis of Four Fish Species Collected in the San Leandro Bay RMP PCB Study in August 2016. SFEI Contribution No. 900. San Francisco Estuary Institute: Richmond, CA. Jabusch, T.; Trowbridge, P. 2018. Microbial Water Quality at Minimally Human-Impacted Reference Beaches in Northern California. SFEI Contribution No. 858. San Francisco Estuary Institute : Richmond, CA. Sun, J. 2018. Non-Targeted Analysis of Water-Soluble Compounds Highlights Overlooked Contaminants and Pathways (Coming Soon). SFEI Contribution No. 905. San Francisco Estuary Institute: Richmond, CA. Robinson, A.; Richey, A.; Slotton, D.; Josh Collins; Davis, J. 2018. North Bay Mercury Biosentinel Project: 2016 - 2017. SFEI Contribution No. 868. Grieb, T.; Roy, S.; Rath, J.; Stewart, R.; Sun, J.; Davis, J. A. 2018. North Bay Selenium Monitoring Design. SFEI Contribution No. 921. San Francisco Estuary Institute : Richmond, CA. Sun, J.; Davis, J.; Stewart, R. 2018. Selenium in Muscle Plugs of White Sturgeon from North San Francisco Bay, 2015-2017. SFEI Contribution No. 929. San Francisco Estuary Institute : Richmond, CA. Sun, J.; David, J.; Stewart, R.; Palace, V. 2018. Selenium in White Sturgeon from North San Francisco Bay: The 2015-2017 Sturgeon Derby Study - (Coming Soon). SFEI Contribution No. 897. San Francisco Estuary Institute : Richmond, CA. Trowbridge, P. 2018. Status & Trends Monitoring Design: 2018 Update. San Francisco Estuary Institute : Richmond, CA. Safran, S. M.; Hagerty, S.; Robinson, A.; Grenier, L. 2018. Translating Science-Based Restoration Strategies into Spatially-Explicit Restoration Opportunities in the Delta (2018 Bay-Delta Science Conference Presentation). In a previous report titled “A Delta Renewed” we offered a collection of guidelines for science-based ecological restoration in the Sacramento-San Joaquin Delta that emphasized restoring or emulating natural processes, anticipating future changes associated with climate change, establishing appropriate configurations of habitat types at the landscape scale, and utilizing a variety multi-benefit management strategies. In this talk, we present on our recent work to support regional restoration planning efforts by developing a repeatable process for using these guidelines to identify spatially-explicit restoration opportunities. The process is largely GIS-based and utilizes spatial data on existing land cover and conservation status, habitat configuration (including patch sizes and distances), surface elevations (including depth of subsidence), and future changes in tidal elevations associated with sea-level rise. By distilling generalized guidelines into spatially-explicit opportunities, we hope to provide a practical tool for incorporating science into planning. To that end, these new methods are currently being piloted through planning efforts focused on the Central Delta Corridor and the McCormack Williamson Tract, and are also being used to assist with the quantification of ecological restoration potential in the Delta Plan Ecosystem Amendment. Fairey, R.; Sigala, M. 2017. 2017 Margins Microplastics Cruise Report. SFEI Contribution No. 848. Coastal Conservancy & Research: Moss Landing, CA. RMP. 2017. 2017 RMP Detailed Workplan and Budget. San Francisco Estuary Institute: Richmond, CA. RMP. 2017. 2017 RMP Multi-Year Plan. San Francisco Estuary Institute: Richmond, CA. Salop, P. 2017. 2017 RMP Water Cruise Report. SFEI Contribution No. 846. Applied Marine Sciences: Livermore, CA. Trowbridge, P. 2017. 2018 RMP Detailed Workplan and Budget. San Francisco Estuary Institute : Richmond, CA. Associates, H. T. Harvey and; San Francisco Estuary Institute (SFEI). 2017. Annotated Bibliography for Sycamore Alluvial Woodland Habitat Mapping and Regeneration Studies Project. One component of the Sycamore Alluvial Woodland Habitat Mapping and Regeneration Studies Project is this annotated bibliography of existing scientific literature pertaining to California sycamore ecology. This annotated bibliography is a product of an extensive review into documents, mapping efforts, and personal communications, and presents sources that have been determined to be relevant to understanding the factors that influence California sycamore health and regeneration in central California. The annotated bibliography is divided into the following sections by topic: General Ecology; Historical and Present Distribution; Restoration Ecology and Management; Wildlife Ecology; Geomorphology; Hydrology and Soils; and Health and Regeneration. Each item is briefly summarized and its relevance to the project is described. References that fall under multiple categories are cross-referenced within the document. Similarly, key words are indicated or each reference to highlight various subtopics affecting California sycamore ecology. De La Cruz, S.; Woo, I.; Flanagan, A.; Mittelstaedt, H. 2017. Assessing the Impact of Periodic Dredging on Macroinvertebrate-Prey Availability for Benthic Foraging Fishes: Final Study Plan and Preliminary Pilot Study Results. SFEI Contribution No. 833. U.S. Geological Survey: Vallejo, CA. Trowbridge, P. 2017. Charter: Regional Monitoring Program for Water Quality in San Francisco Bay. SFEI Contribution No. 844. San Francisco Estuary Institute : Richmond, CA. Robinson, A.; Beagle, J.; Safran, S. M.; McKnight, K.; Grenier, J. Letitia; Askevold, R. A. 2017. Delta Landscapes: A Delta Renewed User Guide. SFEI Contribution No. 854. A Delta Renewed User Guide aims to increase the accessibility of the technical findings in A Delta Renewed for easier application to restoration and conservation efforts across the Delta. The recommendations in A Delta Renewed focus on landscape-scale ecological guidance. We present three examples of how the information in A Delta Renewed might be used to address different management and restoration questions. Because of the complexity of the Delta system, this guide does not address all possible questions and does not replace the need for detailed, site-specific data and expertise. Rather, it shows how the information in A Delta Renewed might provide a common foundation for restoration planning. The User Guide was written for a broad audience, including restoration practitioners, landowners, and local, state and federal agencies. The guide provides a step-by-step path through A Delta Renewed; a user is walked through how to apply the findings of the report via a series of steps to address each of the three restoration and management questions. This process is intended to help the user access regionally-specific recommendations and strategies to plan and manage future Delta landscapes that can support desired ecological functions over the long term. The goal of A Delta Renewed and this guide is not to recreate the Delta of the past. Rather, the objective is to understand how we can re-establish or mimic important natural processes and patterns within this altered system to support desirable ecological functions (such as healthy native fish populations, a productive food web, and support for endangered species), now and into the future. Robinson, A.; Beagle, J.; Safran, S. M.; McKnight, K.; Grenier, J. Letitia; Askevold, R. A. 2017. Delta Landscapes Executive Summary. SFEI Contribution No. 853. Anderson, B.; Phillips, B.; Voorhees, J. 2017. The effects of kaolin clay on the amphipod Eohaustorius estuarius: Part Two. SFEI Contribution No. 822. Denslow, N.; Kroll, K.; Jayasinghe, S.; Adeyemo, O.; Lavelle, C.; Li, E.; Mehinto, A. C.; Bay, S.; Maruya, K. 2017. Linkage of In Vitro Assay Results With In Vivo End Points, Phases 1 and 2. SFEI Contribution No. 823. Sedlak, M. D.; Benskin, J. P.; Wong, A.; Grace, R.; Greig, D. J. 2017. Per- and polyfluoroalkyl substances (PFAS) in San Francisco Bay wildlife: Temporal trends, exposure pathways, and notable presence of precursor compounds. Chemosphere 185, 1217-1226 . SFEI Contribution No. 839. Jabusch, T.; Sun, J.; Sutton, R.; Maruya, K.; Fadness, R. 2017. Pilot Study of Contaminants of Emerging Concern (CECs) in the Russian River Watershed: Lessons Learned. SFEI Contribution No. 852. San Francisco Estuary Institute: Richmond, CA.